The light plane banked to the left. Below the Sepik River snaked like a serpent through the jungle. In places the river almost turned back on itself. Apart from the Sepik there appeared no other breaks in the unremitting green... no roads, no settlements, no airstrip. Nevertheless the pilot appeared to be intending to land.Angry purple rain clouds were swelling on the horizon as we finally caught sight of the tiny waterlogged strip. "Tighten your seat belts and hold on," he said, "this is going to be tricky." It was a soft landing - the mud was like a cushion. Then we spun side-ways and skidded across the grass strip, helter-skelter towards the jungle, stopping a wingspan away from the trees.We climbed out into boggy mud to inspect the damage. The plane had a bad attack of the measles. Its fuselage was spattered with mud but everything else had held together. Just a normal landing in the jungle. We weren't the only ones interested in the plane. Out of the tangle of trees on the edge of the strip a couple of dozen locals materialised quietly. They stopped about a metre from the plane leaning on their spears and looking. Young boys with painted yellow faces and ragged T-shirts, an old man with a piano keyboard smile - all big ivory teeth and black gaps - and women carrying children. Our arrival was an event. The little light planes which buzz like mosquitoes over the highlands of Papua New Guinea are the country's lifeline. So much of it is inaccessible by road. You may fly first class to get here but once you take a light plane in PNG, unless it is a private resort plane, it is not unusual to find yourself sharing your airline seat with a trussed up pig or a basket of chickens. We didn't have any chickens, just three out of place designer suitcases which we unloaded. A tractor and trailer chugged over the swampy ground to meet us. Our luxury transport had arrived. A man in a safari suit, a bush hat and the biggest, bushiest grey beard jumped off the tractor and shook my hands. "I'm Doc, welcome to the Sepik River." Papua New Guinea has a reputation for violence which has made many people wary of visiting. The reputation, in the capital of Port Moresby and in other major cities like Lae, is deserved. Urban crime is rife. However, get away from these areas and you'll find the Land That Time Forgot. The isolation of PNG's hinterland and its mystic river and the violence of its reputation has protected it from the dreaded tourist invasion.The heart of Papua New Guinea doesn't belong to the 20th century. It belongs to the wild jungle, to the crocodile gods, to the ghosts of headhunters and the spirits of the river. It is a magical, mystical, marvellous place. The last we saw of our plane it was being pushed along the airstrip by a gaggle of excited spear-toting locals to try to bump start it for take off.Our transport up river into the heart of darkness was by wooden raft, with a thatched grass roof and an outboard motor attached.It shuddered along the soupy Sepik towards Karawari Lodge. The lodge is built in one of the most isolated places I have ever visited, the only way in is by plane. Trans Niugini Tours owns and operates six wilderness lodges in the remotest and most spectacular corners of Papua New Guinea, this is one of them. it isn't five star luxury by any means, none of the lodges are. over the years they have become a little rough around the edges but the location is spectacular and this is as good as it gets in PNG which is why upmarket operators such as Abercrombie and Kent uses this and its sister lodges - lodges for their tours. Those wanting to visit PNG in safe and cosetted luxury should do so by boat aboard one o the Orion Expedition Cruises. (See box). It balances on a ridge overlooking the river and the curling jungle of the Sepik Basin. The 20 or so huts with their sago palm roofs have verandas that look out over the rainforest. In the morning you can sit and watch the mists rise from the valley floor.A concession to Western needs is a modern bathroom, although I shared mine with a tiny fluoro-green frog. Walk into the main building at the lodge and it's like being in the court of some mad jungle king.The long refectory tables have gigantic carved legs and feet in animal shapes, river spirits hold up the chairs and at the head of the main table is a vast, dark wood throne.Staring down from the walls are warrior masks with pigs tusks, painted shields and crocodile flutes. 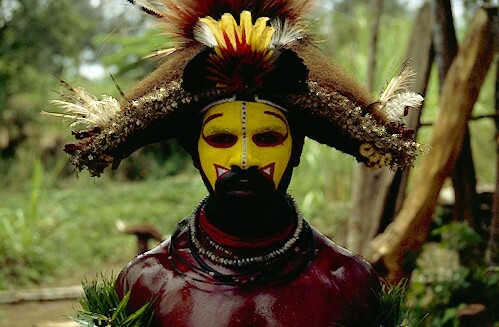 The Sepik region is known for its art.The masks which the river people produce are tantalising and terrible. They are powerful talismans against evil. Every village has its Haus Tambaran or spirit house in which the most sacred carvings are stored and where only men can enter.Where the missionaries have done their work the spirit houses have become sago palm roof churches. In one village we saw a carved figure of a god recycled to represent Jesus with a small loin cloth tacked across his nether regions in honour of his new, modest Christian status. We visited the village one steamy afternoon... three women and a guide in flat-bottomed boat skimming up river, ever deeper into the forest. It felt like something out of The African Queen. ...you'll find the Land That Time Forgot. It belongs to the WILD jungle, to the CROCODILE GODS to the ghosts of headhunters and the spirits of the river. This was our guide's home village. Naked children huddled by the landing stage, women with fierce bones through their noses smiled gentle smiles.The people of the Sepik are a strange mix, friendly to the odd stray tourist - as people who haven't seen too many often are - yet reserved.So much of their culture remains a secret from us. Look closely at some of the shoulders and backs of the men and you'll see a criss-cross of deep scars marked like the skin of a crocodile.These are warriors who have been initiated into the ways of the crocodile god, a powerful icon along the river. Although villages now dressup for the visits of the well-heeled five star passengers of Orion the old men can still remember the days of the headhunters when young boys were not fit to be men until they had killed and brought the skull of their victim back to the village.When the missionaries came they told the villagers to throw away the skulls. Mostly they didn't. They are still kept in sacred places, buried under the poles of the Haus Tambaran or hidden in the hills. Up behind the church with its clothed Christ is a reminder of the former religion. We climbed up to get a view of the river as it coiled into the distance.Our guide leapt on to an outcrop of rock and pulled us up after him.Tombstone grey, it loomed over the hilltop casting a huge shadow. The sky rumbled. We jumped off the rock and headed back to the boat as the spears of rain were hurled from the sky.Just as we went to step into the boat, Sue, one of our party, hesitated. A squat little black carving sat in the middle of the path. It looked as if it was waving at her. "I have to buy him", she said. At $20 he was a bargain. The beginning of a PNG art collection perhaps? "He wards off demons," explained our guide. And hopefully angry rain spirits too. A Voyage of Discovery, this 10 night expedition includes cultural toursim and guests will also have an opportunity to snorkel from pristine beaches. An 11 night expedition including the best of PNG - from iconic handicrafts, pristine beaches and diving to active volcanoes, ancient tropical fjords and the iconic Sepik River. Contemporary art and sculpture from PNG Is becoming more popular with collectors. Daniel Waswas, is probably the best known PNG artist. He is founder of Gallery PNG. His works are currently selling for up to around $US15,000 .